A taste of success can increase appetite. And in San Francisco, California, a novel sustainable start-up has taken a bite. A pioneer in the field, TruValue Labs, has developed state-of-the-art technology capable of providing real-time sustainability analytics through the use of cognitive computing. TruValue Labs is the first-ever company to provide Environmental, Social, and Governance (ESG) data to investors in real-time. The resulting analytics are an effective means to integrate ESG into investment decision-making. We are fortunate to live in a world where Big Data has the potential to alter industries. Technology has given us the ability to analyze massive amounts of data, helping us understand underlying connections and relationships no single analyst would be able to identify. We have already witnessed incredible developments in the healthcare industry through IBM’s Watson Health Cloud, a database that is successfully leveraging cognitive computing to help doctors, researchers, and insurers make better decisions. In this context, only companies that can cost-effectively incorporate Big Data into the decision-making process – and truly understand which data is relevant – will emerge winners. The key to TruValue Labs’ success is the following reality: investors, consumers, researchers, analysts, and corporations are drowning in data. To add insult to injury, said data is not always of the highest quality. Environmental, social, and governance (ESG) data has conventionally relied on subjective interpretations – analysis lacking true benchmarks and sustainability standards. What has constituted “sustainable” has long varied in the eye of the beholder. The Achilles heel of ESG investing today, as with all previous iterations, is that such subjectivity has led to multifarious judgment calls, uncertain standards, and the forming of conflicting company indices. The simple truth: the manner in which companies consider and implement ESG impacts long-term profitability. Investors’ understanding of ESG performance is less defined. 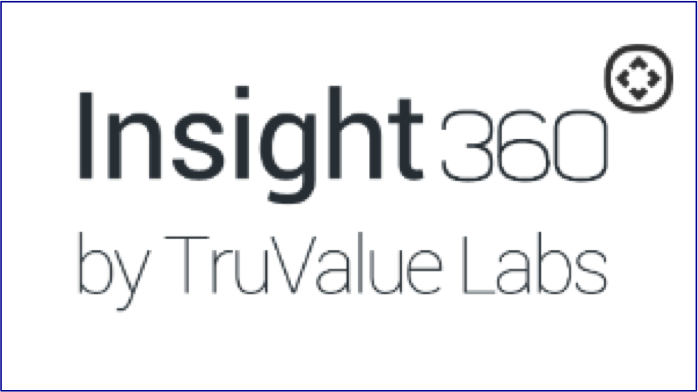 To address the issues facing existing ESG data, TruValue Labs developed Insight360, a comprehensive database able to parse Big Data and provide ESG analytics across six categories: Leadership and Governance, Product Integrity & Innovation, Environment, Workplace, Social Impact, and Economic Sustainability. Insight360’s proprietary algorithm extracts both quantitative and qualitative insights from company reports, social media, regulatory filings, market research, news publications – you name it – and identifies macro and micro patterns for the end-user. By identifying and extracting relevant sustainability content from Big Data, the team at TruValue Labs is striving to provide investment professionals an easy way to integrate consistent and objective ESG data. The scalable nature of the technology means it is possible to easily expand company coverage and add new data sources, with machine learning helping to normalize and standardize data outputs. This data is displayed on a platform, allowing for comparability of the sustainable performance of various companies and industries. Insight360’s ever-growing coverage universe includes the top 500 U.S. listed equities as well as 250 companies worldwide. By the end of this month, the company plans to have expanded its coverage to 7,000 companies. 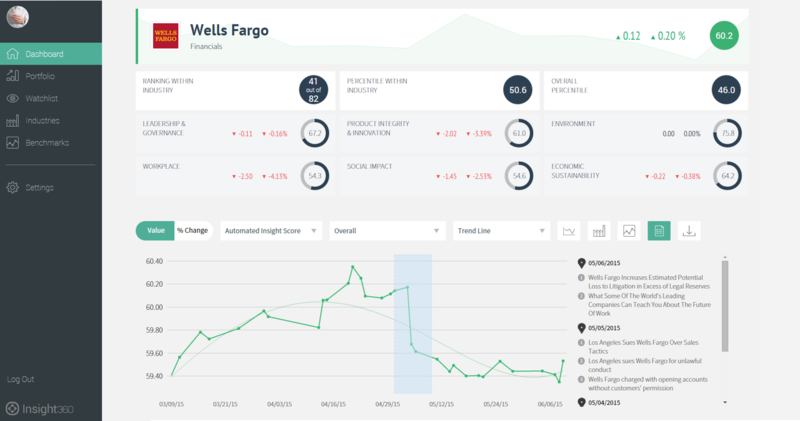 Subsequent to analyzing data, Insight360 generates a dynamic scorecard for all covered companies, displaying trends from continually updated data points. Watch lists can be created, stock performance can be observed, and investment portfolios can be monitored – all from the same platform. Analyzing data in such a manner has never before been possible. The cognitive computing engine powering Insight360 uses natural language processing (which enables computers to extract meaning from human language) to derive quantitative data from semantic input. Cognitive computing is an adaptive approach to computing which allows software to address complex problems by establishing contexts and finding patterns. This approach gives us a unique ability to process big data and gather real-time insights on issues affecting sustainability performance. On June 3rd, 2015, TruValue Labs announced a data partnership with the Sustainability Accounting Standards Board (SASB). The partnership between TruValue Labs and the SASB is a win-win for these two naturally-aligned organizations. 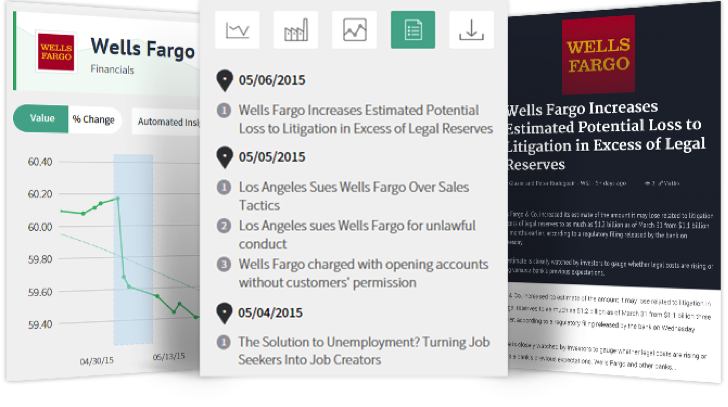 SASB researchers have been granted access to Insight360’s platform of ESG real-time trend lines. Consequently, the data analytics generated from Insight360 can now be used as an input to SASB’s development of sector-specific KPIs. Likewise, through use of SASB’s recognized material sustainability factors, TruValue Labs will be able to further enhance their innovative ESG data platform by incorporating materiality standards. “It’s only natural to offer the SASB research team the use of our technology; we fully support SASB’s efforts and are naturally aligned with their mission to establish sustainability standards that help public corporations disclose material and decision-useful information to investors.” – Hendrik Bartel, Co-Founder and CEO, TruValue Labs. “This partnership with TruValue Labs is a natural fit for SASB. SASB’s framework provides a unique view of the industry-specific sustainability topics that are likely to constitute material information for investors. Integrating SASB standards into Insight360 will enable investors to zero in on trends related to these topics in real time.” – Eli Resisman, Product Manager, SASB. Indeed, the potential benefits are vast. As goes without saying, new technology is not a panacea – while the data it provides can certainly aid investment professionals in analyzing securities, it is not the sole input to successful asset allocation. TruValue Labs has found a way to truly organize Big Data. This innovative company is enabling researchers, analysts, investors, and consumers the necessary access to information imperative to make the decisions that matter – but it is up to the investment community to take advantage of this opportunity. We can – we must – use relevant data effectively to strive towards a more sustainable future. Hats off to TruValue Labs. We need not drown in data. The evolution of ESG estimators reminds me of the ” Better Beta wars” that were espoused subsequent to Markowitz and Sharpe. While the multiple indicators of ESG may seem bewildering, there presence is a strong precursor to materiality and pinpoint the need for consistent ESG coefficients. Importantly, the conversation is changing to a more rigourous approach as proposed by TruValue Labs. As Markowitz pointed out, the need for diversification was established as early as Shakespeare in the “Merchant of Venice.” but then only became entrenched in financial theory when estimators were quantified. Great post and thanks to TruValue Labs. Hi Jeremy – great comment and thanks for subscribing. Indeed the parameters of covariance, beta, and time diversification have been in existence since the Shakespeare era. Antonio portrayed the importance of efficacious measurement when he catastrophically misjudged his diversification. In fact, Markowitz himself quoted Shakespeare in his piece, The Early History of Portfolio Theory: “My ventures are not in one bottom trusted, Nor to one place; nor is my whole estate Upon the fortune of this present year.” See the link below! Present day, the measurement conversation sheds light on the need for a more rigorous approach – as you noted. It also shifts and shapes the discussion toward ESG. 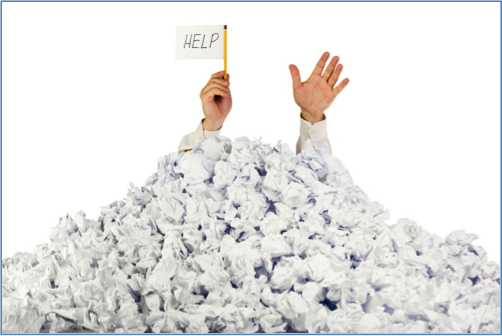 The objectives of both SASB and TruValue Labs are vital for widespread adoption. With such aligned goals, I am very optimistic about this new partnership. One thing has become crystal clear – standards are necessary. We are most interested in any approach which is able to quantify measurements of sustainability for portfolio selection, attribution and frankly just attacking the preconception of investors that there is a trade-off between performance and sustainability. As described, TruValue Labs does not require arbitrary judgments which plague many of the other sustainable indicators currently available. Are there performance analytics or correlation with other indicators available with the TrueValue Labs results? TruValue Labs here. It’s still early days for us in terms of sustainability/performance correlations (the data, after all, is still quite young). However, we have already discovered some interesting results when looking at volatility with respect to several of our sustainability categories. Drop us a line at info@truvaluelabs.com and I’d be happy to tell you more. Thanks for reading Dan – agree!